Stardust and Sensuality at J. Mendel! I was there and I was captivated by the glamorous looks presented on a freezing cold day, in a spacious venue, with amazingly dressed NYFW attendees! 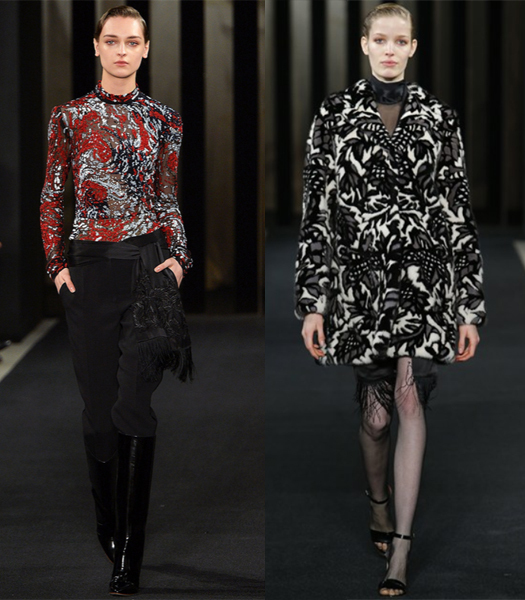 For Fall 2015, the house of J. Mendel celebrates the eternal glamour of New York City’s nightlife, capturing the dazzle and allure of its after-dark scene-stealers in a collection made for life in the spotlight. Even night-owls have to dress for the day, and here the inspirational tone is set by Richard Avedon’s iconic images of Angelica Huston. As reimagined by designer Gilles Mendel for his modern day muse, this calls for effortlessly sophisticated ensembles that convey a certain aristocratic sensuality. Skirt hems hit mid-calf, but are slit up the front and paired with sheer or charmeuse blouses; dresses are long-sleeved, but cut away to bare shoulders or a hint of décolletage. Signatures of men’s evening wear are re-appropriated to convey a resolutely feminine sensibility, as with slouchy tuxedo pants worn tucked into boots like jodhpurs, and fringed formal dress scarves insouciantly draped around the neck, or tied at the waist like an improvised belt. The instinctive cool of a black perforated suede halter dress, worn with micro-fishnet tights and a swingy garnet ermine coat, or a negligee jumpsuit thrown on with knee-high patent boots, gives the impression of a woman who wakes up already planning her night ahead – or perhaps still dressed from the night before. This isn’t about day-to-night dressing, so much as night-for-day. The exceptional artistry of the J. Mendel fur atelier is given full expression without any sacrifice of ease. The leaf print of a plissé skirted shirtdress is echoed in a cropped intarsia mink vest, then amplified in an all-over floral intarsia mink parker. As with a brown velvet mink corduroy coat thrown on over a scarlet skirt ensemble as casually as one would a dressing gown, or the intricate hounds tooth floral motif on a decorative mink cape, the seeming effortlessness of the furs belies the intensity of the workmanship. Whether keeping herself warm in a gossamer ermine or the finest Barguzine sable, this season’s muse carries herself with the innate sophistication of a woman quite literally to the manor born. As the sun sets, the dazzle of disco lights beckon, and the sense of a new decade begins to dawn. The clothes start to shimmer and shine like the Manhattan skyline at night. Mini dresses flash with gold lamé lantern sleeves, or galaxy swirls of sparkling embroidery. 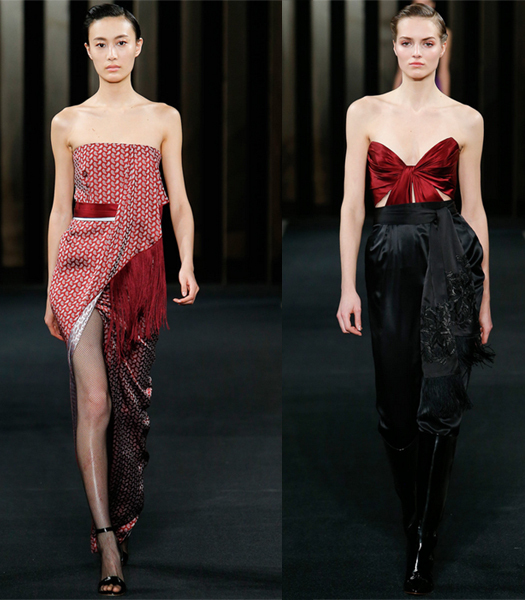 Skin-baring jumpsuits in draped satin or lurex jacquard, accented with the long fringed scarves, look made for dancing. Wrap-skirted gowns in all-over sequins catch the light, as though the pulsating dance floor of Studio 54 were still within earshot. Overtly glamorous as these may be, the house’s signature sensibility of ultra-refinement is ever-present. Accessories stay in the same groove, kicking up light with metallic heeled sandals and gold mirror clutches, or providing additional sheen with glossy knee-high boots. Micro-fishnets are worn throughout, further blurring the demarcation between day and night. 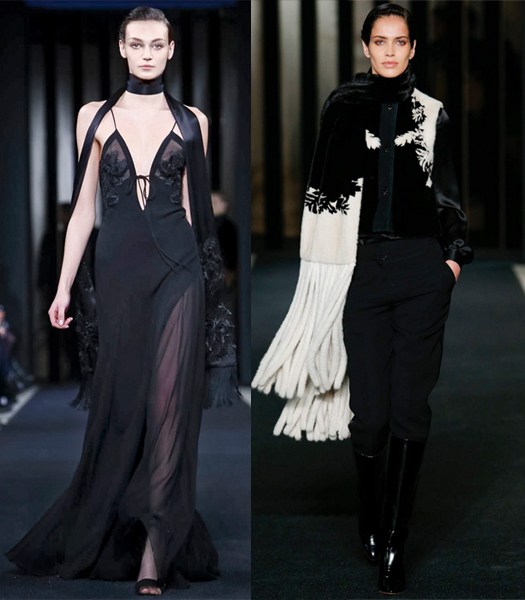 The omnipresent fringed scarf lends an air of almost off-hand glamour. Let’s pay homage to the Golden Age of New York’s nightlife, that heady moment at which high society and celebrity converged! 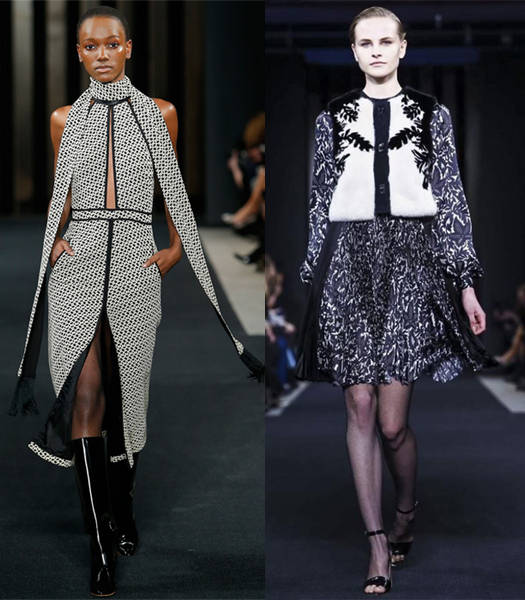 And let’s become that naturally elegant, instinctively cool, and glamorous woman J. Mendel envisions for next season!